Are you thinking about changing your auto insurance policy? Is your policy about to expire and you want to see if you can lower your rates? If so, then this is a smart move, but there are a few things you should think about. One of those is your credit score. Most consumers shopping for car insurance do not realize that a person’s credit rating plays a significant role in the premiums you end up paying. If your credit score has taken a nosedive in recent months, it might be harder to find cheap coverage. If you have bad credit, there is a good chance you could see your automobile insurance costs go up. In rare occasions, your policy could be canceled and find another insurer to cover you could be difficult. If this sounds unfortunately familiar, don’t panic. You can still find companies that do no credit check car insurance quotes. Most of these insurers like GoodtoGoinsurance are online and getting quoted only takes a couple minutes. Insurance companies base the premiums they charge on risk. The less risky a person profile is, the less they will pay for coverage. On the contrary, the more risk a person presents, the higher they will pay for car insurance. In the past couple decades, carriers have put increasing emphasis on a persons credit rating. In theory, the more financial stable you are, the less likely you will be to take crazy risks, like driving intoxicated. This might sound a bit strange, but the correlation bares out in the data. Statistics show that people with better credit scores get into far fewer accidents. Those that are responsible for their money seem likewise, to be responsible behind the wheel. Credit is used for all types of insurance: auto, home, health, and business. Risk management and fraud prevention is something insurers take very seriously. Data also proves that consumers with poor credit tend to file more claims. Even worse, more fraudulent and suspicious claims are filed by individuals with lower ratings. So the reason why those with lower scores are charged such high premiums, or even refused coverage, is because this consumer segment often loses money for insurance companies. Claim costs have gone higher in recent years as vehicle repair, and medical costs have gone up much faster than the pace of inflation and wages. So the reality is, it pays to keep a healthy credit rating, and it will help you lower your auto insurance rates. Get a quote check up with good 2 go insurance and see your custom rates in less than 4 minutes. In general, anything 700 or above is a considered “good.” A score above 700 will not only help you with car insurance but get you better deals on car loans, home mortgages and business loans. If you have a score below 700 don’t feel bad, just focus on getting it up as fast as possible. Some simple things will help you right away like paying all your bills on time, every time. You can also consolidate loans into one and close the outstanding accounts. This will show you have paid off debt and should help your score. You can also check with Experian and other reporting agencies and see what exactly is in your report. If there are false items on your report, get them removed asap and your score will go up. Even if you have a bad score of below 600, you can fix it, just don’t give up. Just create a plan and take disciplined steps to raise it. While most insurers will want your social security number so they can check your credit, there are a few that will not ask for it. If you have bad credit, you should consider getting a no credit check car insurance quotes. 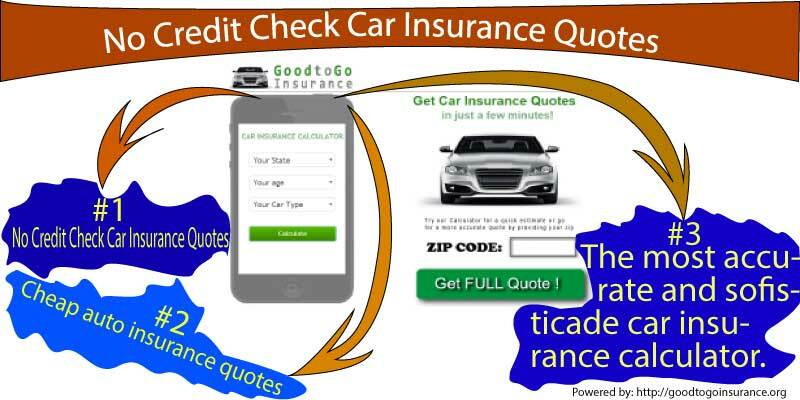 You can use a free quoting service from good to go insurance at this site, and you will be matched with several carriers that do not check credit. Get started now and compare the best online plans at the lowest direct prices.